TechKnowParters has licensed intellectual property from Business Leadership Development Corporation (BLD) for use in its business/technology practice (B/T). 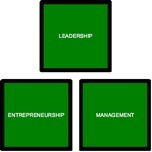 BLD has developed two concepts: individualpreneurship and enterpriship (entrepreneurship, leadership, and management), which are of value to entrepreneurs and business owners. Collectively, we call these concepts I/E. Through its licensing arrangement with BLD, TechKnowPartners is presenting many materials regarding Individualpreneurship and Enterpriship on this site. BLD has published two books that contain selections of this material: "Understanding Personal Styles" and "The Individual As An Enterprise," that are available in TechKnowPartners retail store. Criteria For Sustainability - Are Decisions Responsible - Environmentally? Economically? Socially?